Lay the kraft paper out on a hard flat surface. 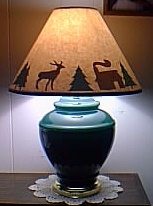 Being careful not to reposition the lamp shade, start rolling the lamp while drawing lines your pencil against the top and bottom rims of the lamp shade. Continue rolling and drawing until you reach the side seam line again. Make a mark on the paper at that side seam line also. On the wrong side (the side that you drew the lines) plan your design with the shapes. Glue your shapes in place as shown in Photo 2, and let them dry completely. Overlap one end over the other to create your seam, make adjustments to fit and then glue the paper seam together. Some paper trimming may be necessary to finish the shade. Now, turn on the lamp, and enjoy your silhouettes! Fun Idea: Make different shades for different seasons or holidays. These shades are easy to slip on and off your lamp.